Vocal nodules are small callous-like bumps located at the junction of the anterior and middle thirds of the vocal folds. They are typically bilateral and are the result of abusive phonation. When nodules become mature and enlarge, they interfere with vocal fold vibration and closure, thereby causing air leakage during phonation. The voice will sound hoarse and breathy as a result of decreased vocal fold closure. Treatment for vocal nodules involves working with a speech language pathologist to change voice behaviors and modify one’s environment accordingly. Typically, nodules can be reduced or eliminated with proper voice care. 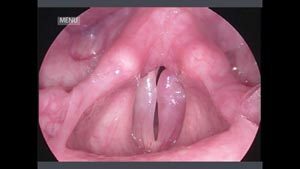 Polyps are small lesions that can occur at any location on the vocal folds. They are often the result of abusive phonation and can occur following a vocal fold hemorrhage. Polyps will many times require surgical removal in addition to direct voice treatment with a speech pathologist. Depending on the location of the polyp, the sound of one’s voice may vary. Cysts are small fluid filled lesions that can also occur at any location on the vocal folds. 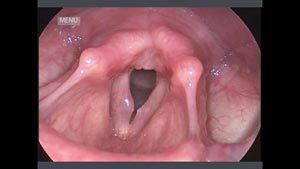 They are the result of trauma to the vocal folds and usually require surgical removal. As with nodules and polyps, a cyst may interfere with vocal fold vibration and will many times result in inadequate vocal fold closure. Vocal fold paralysis is the result of nerve damage and includes the causes of cerebrovascular accident (stroke), trauma, or virus. A person can exhibit a bilateral or unilateral paralysis. The paralysis may be temporary or permanent depending on the site and extent of the lesion. A paralysis in a more adducted (closed) position may spare the voice or only result in mild hoarseness. A paralysis in an abducted (open) position will result in a significantly breathy/hoarse voice due to an inability to close the vocal folds. A person may be at risk for aspiration of liquids and/or solids with this type of impairment. Different options exist for treatment of paralysis. A variety of materials can be injected into the vocal folds to aid with glottic closure. Common materials that are injected include Cymetra, Radiesse and fat. This procedure can be performed in the operating room or in the office. Medialization thyroplasty is a procedure that is typically done using a local anesthetic. It is performed in the hospital and involves placement of a silastic “shim” deep to the vocal cord. This procedure is well tolerated and often dramatically improves vocal quality. Vocal fold bowing results in a small gap in the middle of the vocal folds, causing incomplete vocal fold closure. Several diagnoses may be the cause of vocal fold bowing, although the most common cause is due to age and atrophy of the larynx. Inactivity of the vocal folds can lead to weaker muscles in the larynx, therefore, resulting in a less than optimal voice. Voice symptoms can include weakness, breathiness, hoarseness, or a strained voice if a person is using too much effort with speaking. Patients are instructed with specific exercises that strengthen the vocal folds and improve flexibility. A vocal fold hemorrhage is a bleed that occurs when a blood vessel on the surface of the vocal fold ruptures and bleeds in the tissue of the vocal fold. A hemorrhage appears as an area of redness when visualized with laryngoscopy. Cancer of the larynx is usually diagnosed with exam and biopsy, the most common cause being tobacco use. Laryngeal cancer is usually of the squamous cell type with varying locations. Treatment and surgical options are dependent on the site and size of the tumor. Initial symptoms of this type of cancer are many times a hoarse/gravely voice. If a person is hoarse for more than one month, medical attention is recommended. This is especially true for smokers. Spasmodic dysphonia is a focal disorder that causes tiny spasms at the level of the vocal folds. The most common perceptual symptom is a tight/strained voice, although occasionally a person may exhibit spasms with an excessive breathy vocal quality. The disorder is believed to be neurologic in nature with stress and other environmental factors exacerbating symptoms. This disorder is most common in females with an average onset between the ages of 20 and 50. Although there is no cure for spasmodic dysphonia, injections of botulism toxin (Botox) have been very effective in reducing or eliminating the spasms temporarily. Patients usually return for repeat injections every 3 to 6 months. In addition to Botox, treatment by a speech pathologist has been shown to lengthen times between injections and further improve vocal quality. 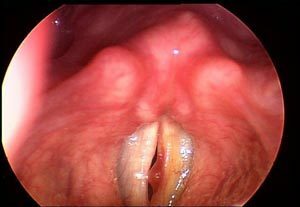 One of several subtypes of vocal polyps. This lesion has the appearance of a “blood blister” on the vocal fold. It may be associated with acute vocal trauma that causes abrupt and fairly severe hoarseness that is somewhat persistent. Small hemorrhagic polyps may resolve non-surgically but usually require many months to do so; larger ones should be considered surgical lesions. Fortunately, the prognosis for full recovery after surgery is excellent. Polypoid Degeneration is vocal cord swelling due to a build up of fluid. It can be caused by gastroesophageal reflux, smoking, hormonal problems and chronic voice abuse. The condition is most common in middle-aged or post-menopausal women who have a long history of smoking. Polypoid Degeneration tends to virilize (masculinize) the quality and capabilities of a voice; therefore, this is most noticed in women. Presbylaryngis is thinning or aging of the vocal cords) causes the edges of the vocal cords (which normally close completely together) to no longer meet as they should. The result – commonly seen in older patients – is a thinned, diminished voice. A vocal process granuloma is a growth of tissue that occurs over the vocal process. The vocal process is part of the arytenoid cartilage, which is the cartilage responsible for moving the vocal folds. Vocal process granulomas are non-cancerous growths that arise in response to irritation, and may occur as a result of acid reflux recent intubation?vocal habits. A lesion that is situated below the glottis (a part of the cavity of the larynx below the true vocal cords.